Sunrise, sunset, awesome sky, puffy cloud, sparkling water…these were color inspirations for the Dragonfly Paddle Board team. Most of all, the colors were created to make you smile. You'll feel good “aboard” while riding on your custom color combo. Choose from our standards: Aquamist, Banana Beach, Coconut White, Constant Coral, Lively Lime, Papaya Pucker, Pink Pearl and Seafoam. Want something a little more special? We've got graphics and colors and we're open to ideas. Call…let's talk about it. Where would we be without accessories? At Dragonfly Paddle Boards you can count on us to not only keep it simple but to offer the best of the best. Just scroll through the options to choose what you need, what you want and what you'd like to have (a perfect time to start your Christmas list while you're at it). 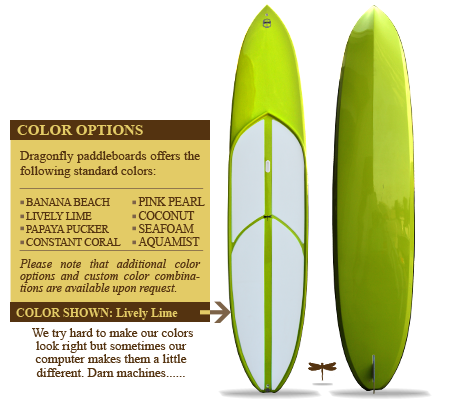 Seating choices, specialty fins and even specialized paddles are available for those wanting focused equipment to match their paddling circumstances. Fishing runs in our veins at Dragonfly and we're proud to sell the gear that gets you closest to your goal. 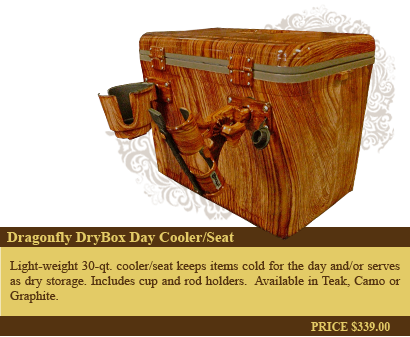 And keep your eyes open…some of our best products are brought to our attention by Dragonfly customers. We're always there to take your call.